What a day! Longest so far on the tour but unexpectedly so. Woke up to some uninspiring weather. Cold and raining. Rain was constant throughout the day so photo opportunities were scant. Usual start time on the road of about 9:30am. Followed the esplanade along with the water front for a while before hitting some back roads. Got to an intersection in the middle of nowhere and saw a group of roadies approaching. 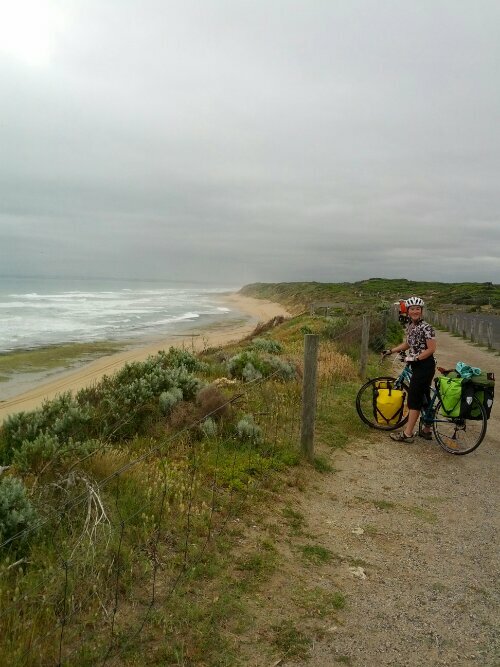 We got some directions which included a 4km of sealed bike path before winding back along the coast in to Barwon Heads for morning tea. Whilst eating our baked goods, one of the roadies came past again much to his and our amusement. 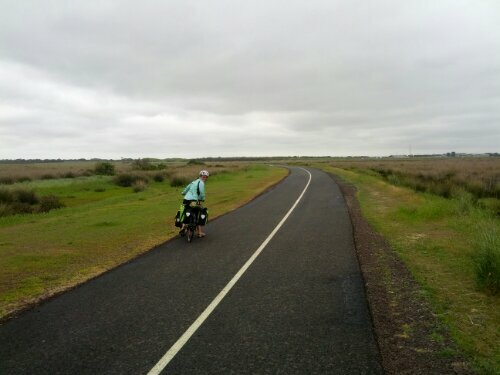 We had a bit of gps navigation fail heading through Ocean Grove. Went though all these suburban back streets which were hilly instead of the main road. 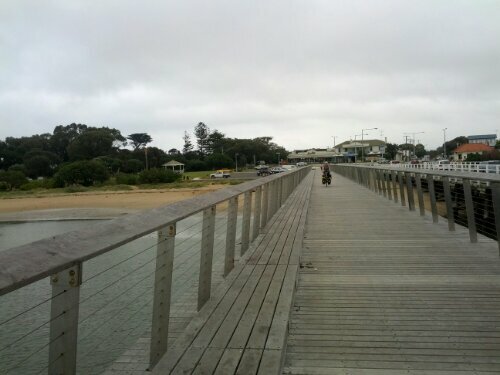 Once successfully back on the correct road, the going was fast in to quaint Queenscliff. Unfortunately, not much time to explore the village as we arrived just in time to hop on the next ferry to Sorrento. The ferry was huge and modern and even had an on board Cafe. Plans for the afternoon were formulated with the hope of making Dromana for the evening. Once we disembarked, the rain got harder but the flat terrain and decent bike lane made the going very quick and we easily sustained a 23km/hr average and even saw a dolphin. 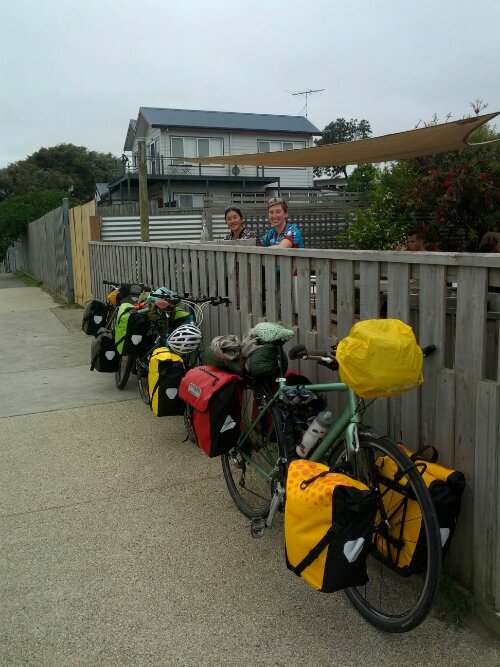 We arrived in Dromana at 3pm and decided the further 17km to Mornington would be worth getting done. Little did we know that the next 17km were nothing like the previous flat that we had ridden since the ferry. The windy road climbed Mount Martha and there was a lot of signage telling us to ride single file. 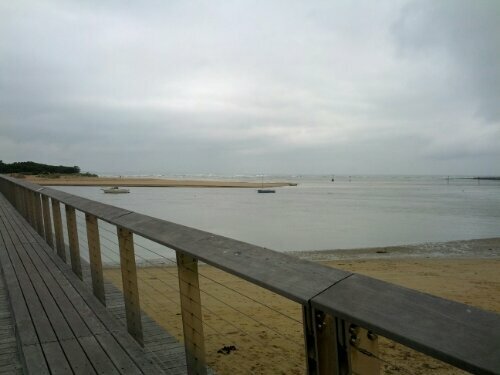 We finally made it into Mornington at 4pm and had a coffee to warm up before hitting the shops for dinner groceries. 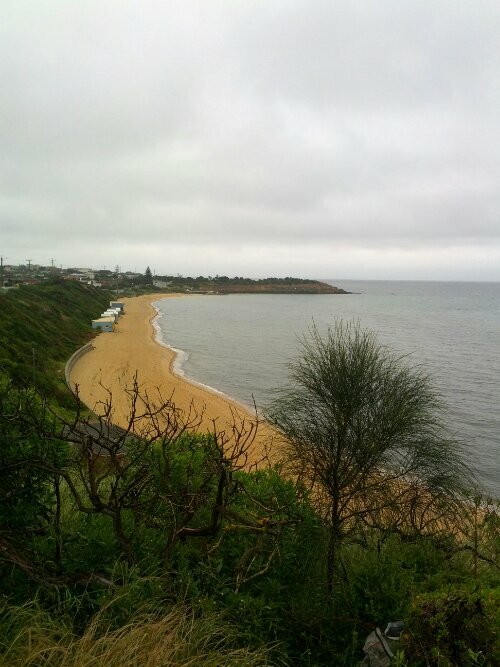 I wish the weather was better and we could have had better views of Port Phillip Bay. Ahh well, have to leave something for next time. Does a bad day cycling beat a good day at work?